Mike Neff, right, will join the “Sarge” at Don Schumacher Racing. Neff, who finished the 2017 season at rival John Force Racing, replaces veteran tuner Mike Green on the U.S. Army dragster. Neff’s previous stint at DSR saw him win the 2005 Funny Car championship as crew chief on Gary Scelzi’s Dodge team. Neff worked at DSR from 2001-07 before moving to JFR, where he helped earn the 2010 Funny Car crown with team-owner John “Brute” Force. Neff also won a Funny Car national event in 2009 as a driver/tuner. Green, who helped guide Schumacher to 27 event titles and championships in 2009 and ’14, will remain at DSR. Green’s input on safety and performance projects have been vital to the organization’s success, Don Schumacher said. “We welcome Mike Neff back to the DSR family,” Don Schumacher said. “We know Mike will be a great asset to DSR and feel he will help the Army team run for a championship in 2018. Mike knows DSR and we know his talents as a crew chief. Green’s resume includes stints at Don Prudhomme Racing, Darrell Gwynn Racing and Joe Gibbs Racing. Tony Schumacher, Don’s son, finished eighth in the final 2017 Countdown to the Championship point standings that saw Brittany Force of JFR emerge as a first-time world champion in her Monster Energy dragster. Force won four races, including the season-ending 53rd annual Auto Club NHRA Finals at Pomona (Calif.) Raceway, after Steve Torrence and his Capco Contractors dragster dominated the class with eight victories. Tony Schumacher scored his lone victory of 2017 in Round 3 of the 24-race Mello Yello Drag Racing Series schedule at the 48th annual Amalie Motor Oil NHRA Gatornationals in Gainesville, Fla., on March 19. Schumacher has posted three wins over the last two seasons to raise his career total to 83. Schumacher registered his most recent championship in 2014, when he won five national events. Neff began the season as crew chief on Robert Hight’s Auto Club of Southern California Chevrolet Camaro SS Funny Car but ended it on John Force’s PEAK Coolant & Motor Oil team. Force orchestrated a switch of crews heading into the Gatornats _ just two races into the season. In what rated as the latest layer of intrigue surrounding the relationship between crew chief Jimmy Prock and Force, Prock was moved to Hight’s team while Neff switched to Force’s car. Moving with Prock were co-crew chief Chris Cunningham and crew members who started the season with Force’s team, while co-crew chiefs Jon Schaffer and Jason McCulloch and Hight’s former team members moved to Force’s car. The move was capped when Hight added the 2017 Funny Car championship to his 2009 title. Hight’s championship season featured four victories, including two wins in the summertime Western Swing and two victories during the Countdown. He earned eight No. 1 qualifiers and two runner-up finishes. During the event in Brainerd, Minn., Hight set the Funny Car national elapsed-time record with a 3.793-second pass. In Sonoma, Calif., Hight set the national speed record with a pass at 339.87 mph. Force, the record-setting 16-time world champion, scored one win en route to a seventh-place point finish in 2017. 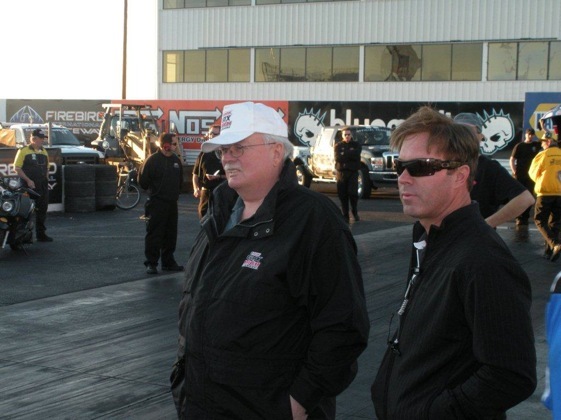 In 2010, Neff became the second Funny Car crew chief to tune two drivers to world championships. Working alongside nitromethane gurus Austin Coil and Bernie Fedderly, Neff guided John Force to his 15th championship. Neff was a fulltime mechanic on the Funny Car in which Cruz Pedregon beat Force for the 1992 championship. Neff worked with “The Cruzer” through the 2014 season before moving to the Top Fuel dragster driven by Cory McClenathan. Neff joined DSR in 2001 as assistant crew chief on a Funny Car driven by Whit Bazemore. In 2002 Neff was promoted to Funny Car crew chief for Scotty Cannon, the Pro Modified star who subsequently relinquished the seat to Scelzi. Ironically, Neff’s work with Scelzi in 2005 ended JFR’s streak of 12 consecutive Funny Car championships. Neff joined JFR at the end of 2007 as driver of a fourth Ford Mustang Funny Car and went on to earn the Auto Club Road to the Future Award as NHRA’s Rookie of the Year the following season. Neff posted a victory in 2009 before moving back into the role of crew chief in 2010. In 2011, Neff pulled double duty by tuning and driving the Castrol GTX Mustang Funny Car. In other DSR news, the Matco Tools/U.S. Army Top Fuel dragster driven by three-time world champion Antron Brown will be tuned by Mark Oswald and Brad Mason in 2018. The latter replaces Brian Corradi. Brown will enter the 2018 season with 49 career Top Fuel victories. Oswald, the 1984 Funny Car world champion, added the 2012, 2015 and 2016 Top Fuel titles to his resume working with Corradi on Brown’s car. A four-time national event winner in 2017, Brown finished fourth in the final point standings. DSR also promoted car chief Dustin Heim to be Rahn Tobler’s assistant crew chief on the NAPA Auto Parts Dodge Charger R/T driven by 2016 world champion Ron Capps. An eight-time winner in 2017, Capps finished second to Hight in the final standings. Heim has worked at DSR since 2009. DSR’s seven race teams compiled 25 wins, 22 runners-up, 19 poles and one Traxxas Funny Car Shootout win last season. DRS’s teams will begin the 2018 campaign with preseason testing near Phoenix on Jan. 31. The 24-race NHRA season will begin with the 58th annual NHRA Winternationals on Feb. 9 at Pomona Raceway. In addition to Schumacher’s and Brown’s Top Fuel teams, DSR’s lineup includes the dragster driven by Leah Pritchett. Capps leads a Funny Car lineup featuring 2011 and 2014 world champion Matt Hagan in the Mopar Express Lane Dodge Charger R/T; 2012 NHRA world champ Jack Beckman in Terry and Doug Chandler’s Infinite Hero Foundation Dodge and the Chandlers’ Make-A-Wish Dodge driven by Tommy Johnson Jr.
DSR has won 318 NHRA national event titles and 16 world championships.